We are currently performing maintenance work to our user database and so some parts of the site are inaccessible. These include the user registration/accounts areas, competition entry, basket and checkout. We apologise for any inconvenience and normal service will be resumed very soon. Please enjoy browsing the rest of the site while we complete this work. The webcart will be available soon. In the mean time please call our Customer Service Advisors on 01778 392466 who will happily assist. 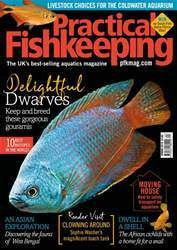 We are currently in the process of setting up the store for Practical Fishkeeping, please check back later.